The Indian National Congress has always upheld India’s supreme national interests and has often braved criticism and opposition both at home and abroad in defending the country’s interests. At the same time, the Indian National Congress has always believed that it is India’s historic destiny to be engaged and connected with the rest of the world and, in particular, with the countries of Asia. The foreign policy followed in the past five years has yielded handsome results: the foremost example is the agreements on civil nuclear cooperation signed with the USA, Russia, France and Kazakhstan. India’s well-thought out foreign policy and its patient but forceful diplomacy has obliged Pakistan to admit that its citizens were responsible for carrying out the dastardly attacks in Mumbai in November 2008. The Indian National Congress has striven for an enduring peace and for close economic relations with Pakistan. The Indian National Congress has also encouraged extensive people-to-people contacts between the two countries, particularly amongst the younger generation. But the Mumbai attacks have cast a long shadow on the on-going dialogue and engagement process. It is now entirely upto Pakistan to break the impasse by taking credible action against those responsible for the carnage in Mumbai. The long-held policy of the Indian National Congress is that the Government of Sri Lanka should find an honourable solution to the strife in that country and ensure that all communities, especially the Tamils peaking people, are guaranteed and enjoy equal rights within the framework of a united Sri Lanka. The Indian National Congress offers to help the parties reach an agreement as envisaged in the India-Sri Lanka Peace Accord of 1987 which remains the only basis for a politically negotiated settlement. The Indian National Congress welcomes the return of multi-party democracy to Bangladesh and Nepal. It will work with both countries to deepen bilateral ties across a wide spectrum of areas for demonstrable mutual benefit. The Indian National Congress also believes that the two countries must take note ofIndia’s security concerns in a more meaningful manner. The Indian National Congress has always championed the legitimate and peaceful aspirations of the longsuffering Palestinian people and urges that a viable Palestinian state be established at the earliest. India’s relationships with countries like the USA, Russia, China and Japan and with countries of Europe have been transformed by sustained diplomatic efforts since 2004. These relationships will be further deepened. The UPA Government will pursue an independent foreign policy, keeping in mind its past traditions. This policy will seek to promote multi-polarity in world relations and oppose all attempts at unilateralism. The UPA Government will give the highest priority to building closer political, economic and other ties with its neighbours in South Asia and to strengthen SAARC. Outstanding issues with Bangladesh will be resolved. Intensive dialogue will be initiated with Nepal for developing water resources to mutual advantage. Traditional ties with West Asia will be given a fresh thrust. Steps will be taken to withdraw Indian mercenaries from Iraq, while further recruitment for this purpose will be banned. Even as it pursues closer engagements and relations with the USA, the UPA Government will maintain the independence of India’s foreign policy position on all regional and global issues. The UPA is committed to deepening ties with Russia and Europe as well. UPA Government will fully protect the national interest, particularly of farmers, in all WTO negotiations. Commitment made earlier will be adhered to even as efforts are mounted to ensure that all agreements reflect our concerns fully, particularly in the area of intellectual property and agriculture. The UPA Government will play a proactive role in strengthening the emerging solidarity of developing countries in the shape of G-20 in the WTO. India supported Nepal through its peace process and transition to a democratic, stable, peaceful and prosperous State. A Rs. 1,000 crore assistance package, material support to holding of Constituent Assembly elections. India is investing overRs.1600 crore to construct roads in Nepal’s Terai area, establish two integrated check posts ( Raxaul) and build two cross-border railway links. India has also agreed to provide 250 MW from the grid to help address their energy requirement and to facilitate transit of goods to Nepal and Bhutan. Several important agreements relating to security, counter terrorism, power and culture were signed during the visit of Bangladesh Prime Minister Sheikh Hasina in January 2010. India has provided a Line of Credit of US$ 1 billion to Bangladesh to support infrastructure projects, including in the areas of railway infrastructure, supply of locomotives, coaches,buses and dredging. India-Sri Lanka relations have undergone a qualitative shift in the recent past, especially in the areas of economic cooperation, investment, connectivity and developmental projects. India has expressed its conviction that there is no military solution to the ethnic problem in Sri Lanka and the only way out is a negotiated, political settlement acceptable to all sections of society. The end of three decades of protracted conflict in May 2009 provides the opportunity for Sri Lanka to return to normalcy. India has continued to urge the Government of Sri Lanka to find a negotiated political settlement acceptable to all sections of society. India has been assisting in the rehabilitation of the internally displaced persons in Northern Sri Lanka as well as in reconstruction and developmental activities. India has announced a grant of Rs.500 crore to support this process. Our extensive assistance includes provision of field hospitals, artificial limb fitment camps, seven demining teams, supply of shelter materials, agricultural starter packs etc. Projects relating to railway infrastructure are being taken up through the Line of Credit for US$ 413 million. In Sri Lanka we have contributed substantially to the resettlement of the internally displaced persons and the reconstruction of Northern and Eastern Sri Lanka. India announced an initiative to build 50,000 houses in Northern and Eastern Sri Lanka. We have also continued our assistance programme to the Indian Origin Tamils in the up-country areas. The opening of two new Indian consulates in Jaffna and Hambantotain 2010 has imparted further momentum to our ties. During the last four years, bilateral relations with Myanmar have deepened. Several cross-border projects are being taken up with Myanmar, including the Kaladan Multi-Modal Transit Transport Project, which will give a boost to development of the Northeastern Region. The ground-breaking ceremony of the Kaladan Multi-modal project in Myanmar was held in December, 2010. With Pakistan, the Government has pursued a policy of constructive engagement to establish peaceful, friendly and cooperative relations through the composite dialogue process predicated on Pakistan fulfilling its commitment not to permit any territory under its control to be used to support terrorism in any manner. The peace process with Pakistan has produced several gains and enhancement in people-to-people relations. Bus services have commenced on the Amritsar-Lahore, Amritsar- Nankana Sahib, Srinagar-Muzaffarabad and Poonch- Rawalakot routes. Trucks now ply across the Wagah-Attari border. It has been decided to include Lahore as a stop for the Amritsar-Nankana Sahib bus service. The Munabao-Khokrapar Thar Express has commenced. Government’s expectation that Pakistan acts with purpose against the perpetrators of the Mumbai attack was conveyed on several occasions, including at the highest level. India reiterated the need for Pakistan to fulfill the assurances given by its leaders not to allow the use of territory under Pakistan’s control for terrorism directed against India. During the year, Prime Minister had bilateral meetings with President Asif Ali Zardari, who paid a private visit to India in April 2012 and Prime Minister Syed Yousuf Raza Gilani on the margins of the SAARC and Nuclear Security Summits. The year also witnessed completion of the first round of the resumed dialogue in July 2011 and commencement of the second round of dialogue. The resumed dialogue process has resulted in some concrete positive developments, particularly in the area of economic cooperation. With admission of Afghanistan in SAARC and a major role played by India in the reconstruction and rehabilitation of Afghanistan, India’s relations with the country have achieved greater depth. India’s development partnership with Afghanistan, which spans the entire gamut of socio-economic developmental activities, is spread all across the country and has earned tremendous goodwill of the Afghan people, cutting across ethnic and regional lines. Despite attacks by extremist forces, India’s commitment to assisting the people and Government of Afghanistan as they build a democratic, pluralistic and peaceful country remains undiluted. UPA Government has entered into a Full Strategic Partnership with Afghanistan. The strategic partnership between the two countries was further strengthened by the continuation of high level visits, including that of President Karzai, and other high dignitaries. The year 2011 witnessed the formalization of the Strategic Partnership between India and Afghanistan. The contours of the Indian assistance programme in Afghanistan, were outlined during the visit of the Prime Minister to Afghanistan in May 2011. Prime Minister also addressed a joint session of the Afghan Parliament and announced a further increase in India’s aid commitment to Afghanistan by US$ 500 million, thus raising the cumulative Indian commitment to Afghanistan to US$ 2 billion. An agreement on the political parameters and guiding principles for the settlement of the India-China boundary question has been signed. Border trade has been opened at Nathula. In addition to strengthening of bilateral relations, the recent period witnessed emerging congruence on global issues such as climate change, WTO and the new global financial order. In 2010, the two countries are celebrating the 60th anniversary of the establishment of diplomatic relations and a series of activities are being organised to mark the occasion. The visit to China by President Smt. Pratibha Devisingh Patil in May, 2010, followed by the visit of Premier Wen Jiabao to India in December, 2010 were in addition to several other substantive interactions on the sidelines of major regional and multilateral events. The year 2011 was celebrated as the year of India-China Exchange. Prime Minister Dr. Manmohan Singh and President Hu Jintao jointly launched the 2012 Year of Friendship and Cooperation during the latter’s visit to India for the BRICS Summit. Bilateral trade volume crossed US$70 billion. India and China have also announced new initiatives for cooperation on maritime security and consultation on regional affairs. A new Working Mechanism for Coordination and Consultation on India-China Border Affairs has also begun discussions. India is continuing its broad-based development assistance to Bhutan. India is providing assistance to Bhutan in developing its hydropower sector and to purchase at least 10,000 MW of power from Bhutan by 2020. Ten hydropower projects, identified for the purpose, are at various stages of implementation. India and Japan have forged a strategic and global partnership. The two sides have also issued a Joint Declaration on Security Cooperation and an Action Plan to advance their security cooperation. We consolidated our strategic and global partnership with Japan through conclusion of negotiations on the Comprehensive Economic Partnership Agreement during Prime Minister’s visit to Japan in October, 2010. Our decision to dispatch a rescue and rehabilitation team to some of the worst affected areas after the havoc wrought by the recent earthquake and tsunami in Japan has been warmly appreciated by the government and people of Japan. The comprehensive Economic Partnership Agreement (CEPA) with Japan came into force on 1st August 2011. The India -Japan Annual Summit 2011 was held in December in New Delhi. Our Comprehensive Economic Partnership Agreement with the Republic of Korea became operational in 2010 and is expected to provide a major boost to bilateral trade and economic flows. 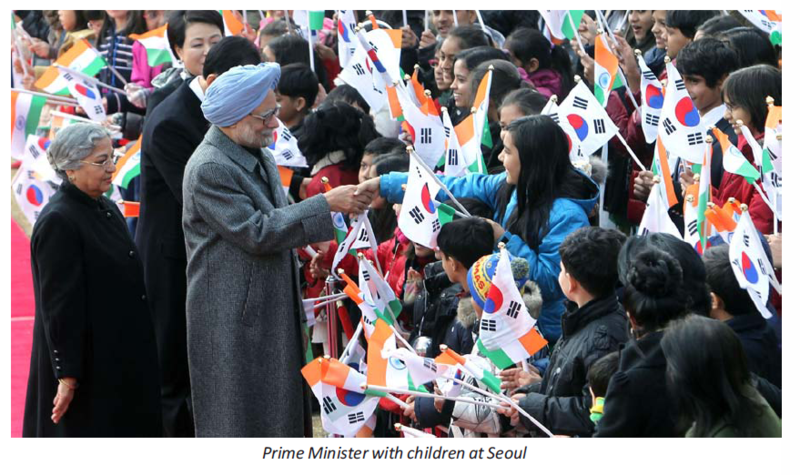 Growth of bilateral relations with Republic of Korea received a new impetus with visits by the President and the Prime Minister to Seoul in July 2011 and March 2012 respectively. The ‘Look East’ Policy has been pursued with vigour. An intensive programme to engage the Northeastern States of India was launched for facilitating development of the Northeast Region. Regular participation in the India-ASEAN and East Asia Summits as well as agreements and MoUs in a wide range of spheres have fostered close cooperation with South East and East Asian countries. The Government is engaged in the revival of Nalanda University as a centre for cultural exchange in the region. India continued to improve and consolidate its political, economic and cultural interaction with countries in the South East Asia and the Pacific, both in the bilateral and the multilateral context. Agreement in all ten ASEAN Member States. Total ASEAN-India trade reached US$ 57.89 billion in 2010-2011, showing an increase of 30% over the previous year. The Gulf region has been made an area of special focus in the UPA Government’s foreign policy. There has been intensification of high-level interactions for cooperation in economy, trade and defence, etc., with several agreements being signed in the areas of combatting crime, legal assistance, double taxation avoidance, investment promotion, air services and cultural cooperation. Our relations with all countries in the West Asia and North Africa region were strengthened further in several areas including through movement of professionals, energy, trade & investment. India has been closely monitoring the developments in the West Asian and the Gulf region, which has immense importance in our foreign policy. The region hosts more than six million Indians, besides being a major trading partner and energy supplier for India. 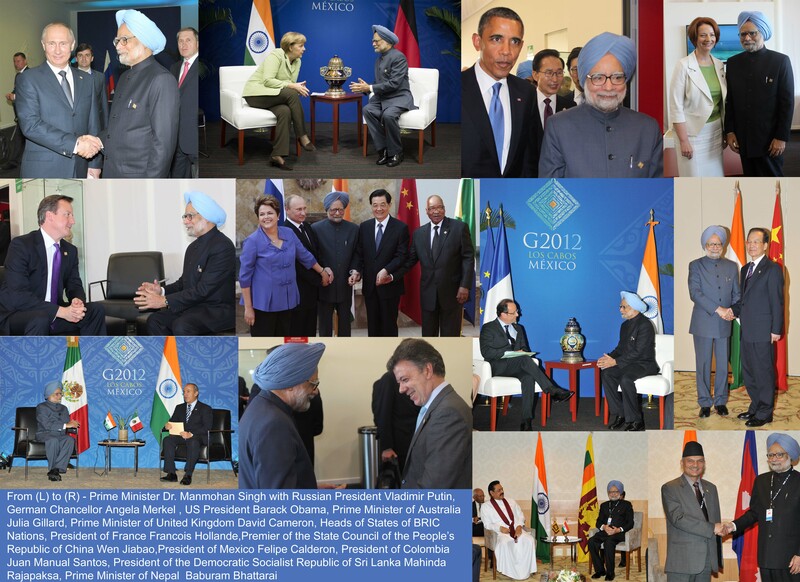 During 2011, India continued its high-level engagements with the countries of the region. Diplomatic relations with Iraq were upgraded and the new Ambassador of India presented his credentials in June 2011. With Oman, the commissioning of the Bharat Oman Refinery Limited (BORL) in Bina, in May 2011 was the highlight of bilateral investment relations between the two countries. Relations continued to strengthen with countries of the Central Asian region, which is part of our extended neighbourhood. The Turkmenistan-Afghanistan-Pakistan-India (TAPI) gas pipeline project received a fillip with the signing of framework agreement among the four countries in December, 2010. Central Asia continued to figure prominently in India’s priorities. Our relations with Kazakhstan and Uzbekistan were elevated to the level of “strategic partnerships”. Agreements in key areas such as civil nuclear cooperation and hydrocarbons were also signed with these countries. India’s strategic partnership with Russia has been further developed and strengthened, through expansion of bilateral cooperation in the fields of defence, space, trade and economy. Summit-level visits have taken place every year. A forward-looking framework agreement on nuclear energy cooperation, envisaging joint collaboration in S&T, setting up of nuclear power plants and indigenization of reactor component manufacturing in India, was concluded. The momentum of India’s “special and priviledged” Strategic Partnership with Russia continued to grow during 2011-12. Cooperation in diverse sectors such as defence, civil nuclear energy, hydrocarbons, information technology, pharmaceuticals, space, education and Culture reflected the multifaceted and dynamic nature of our timetested and historic ties. The 12th India-EU Summit was held in New Delhi in February 2012. This was the first Summit-level interaction in India following the implementation of the European Union’s Lisbon Treaty. The first Indo-German Intergovernmental Consultations between Prime Minister Dr. Manmohan Singh and German Chancellor Angela Merkel were held in New Delhi in May 2011. Estonia opened a Resident Mission in New Delhi in February 2012. There has been a transformation in India-US relations following the exchange of visits between the Prime Minister and the US President. Indo-US cooperation now spans a wide spectrum, including high technology, space, agriculture, education, trade and economic linkages, and there is prospect of civil nuclear cooperation. Regular interactions on issues of mutual interest, including regional and global issues of common concern, are reflective of the deepening of India-US relation. The India-US global strategic partnership was marked by continuity and wasfurther strengthened. In July 2009, the two governments announced their new Strategic Dialogue comprising the five pillars of (a) strategic cooperation; (b) energy and climate change; (c) economics, trade and agriculture;(d) education and development; and (e) S&T, health and innovation. At the Summit Meeting in November 2009, the two sides decided to launch a new phase in their transformed global strategic partnership. Progress was made towards implementation of the India-US Civil Nuclear Agreement. Several cooperation agreements in diverse areas such as energy, climate change, agriculture, education,women’s empowerment, etc. have deepened the relationship. Trade in goods and services with the United States together crossed US$ 100 billion in 2011, with the balance in India’s favour. Africa Forum Summit. India has extended substantial and wide-ranging cooperation to countries in Africa through the TEAM-9 initiative, New Partnership for Africa’s Development, Aid to Africa programme, Pan-African Network to provide tele-education and telemedicine facilities from India to all African countries, peacekeeping and technical cooperation. India has signed Trade Agreements with 29 countries in Africa. The traditional India-Africa partnership has been revitalised through the India Africa Forum Summit 2008. The Pan African E-network 65 Project providing the telenetwork and tele-medicine facilities has now been acceded to by 47 out of the 53 African countries. India has taken concerted steps to strengthen relations with leading Latin American countries, such as Brazil, Mexico, Argentina, Colombia and Chile. India assumed SAARC chairmanship in April 2007 and took the successful initiative of moving SAARC from a declaratory to an implementation phase. Significant progress has been made in the establishment of the South Asian University proposed by India. A decision has been taken to operationalise the SAARC Development Fund. India, Bangladesh and Sri Lanka have ratified an agreement on the SAARC Food Bank. India has taken the initiative of allowing duty-free access to exports from the less developed countries in SAARC region. India’s commitment to its immediate neighbourhood has revitalised SAARC with the implementation of a number of regional and sub-regional projects focused primarily on development. New initiatives have included the setting up of the SAARC Development Fund, establishment of the SAARC Food Bank, implementation of regional projects in telemedicine, tele-education and agriculture and conclusion of the SAARC Convention on Mutual Assistance in Criminal Matters. 2010 saw considerable progress in implementation of flagship projects in SAARC like the South Asian University (SAU) and the SAARC Development Fund. The SAU’s first academic session commenced from August 2010 with two Master’s Courses being offered to 50 students from all across the region. India has continued to engage actively with key regional groupings such as ASEAN, the East Asia Summit, IBSA, ACD, ASEM and others. Vice-President led the Indian delegation to the 8th Asia Europe Meeting (ASEM) in Belgium in October 2010. India hosted the Fourth BRICS Summit in New Delhi, and took over the Chairmanship of the Group. Highlights of the Summit included a decision by the leaders to examine the feasibility of setting up a BRICS Development Bank. During its presidency of the Security Council in August 2011, India organized a thematic debate on UN Peacekeeping that highlighted the critical importance of consulting troop contributing countries in decisions related to mandates of peacekeeping missions. Along with other like-minded countries, India launched a major initiative to build support for an expansion of the UN Security Council in both permanent and non-permanent categories of Membership. In the G-20 process, India emphasized the development dimension and the need for promoting global economic growth. India continued with its contributions to UN Peacekeeping efforts, and we remain one of the top three contributors, with about 9,000 troops deployed in nine UN peace keeping missions around the world. India plays an active role in various multilateral economic groupings, including the G-20, to address global challenges such as the economic and financial crisis, food security, climate change and energy security. India continued its efforts to promote India’s image abroad and particularly reach out to the younger generation through new social media tools. The Indian Council for Cultural Relations, and its 28 Indian Cultural Centres abroad, actively promoted Indian culture abroad. 2,350 new scholarships were awarded to foreign students during 2010-11. India has a long-standing commitment to South-South cooperation and we continueto provide substantial development assistance through our ITEC and SCAAP programmes, which have acquired a brand name in the developing world, and through our Lines of Credit. 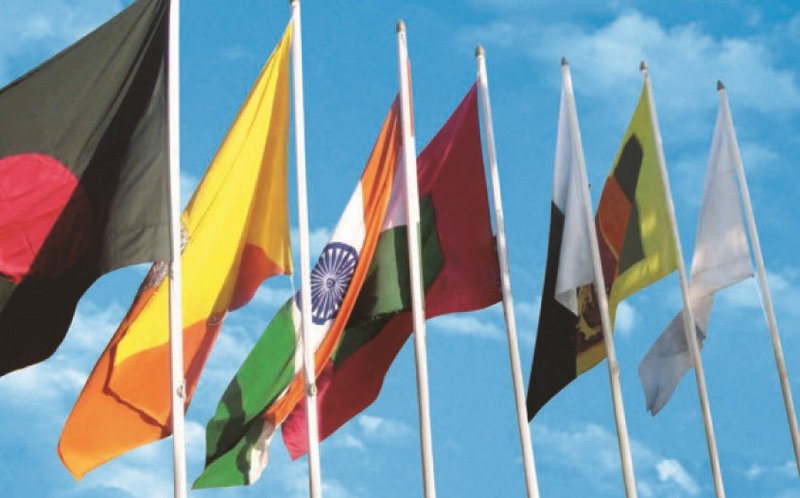 The Indian Technical and Economic Cooperation (ITEC) Programme, the Special Commonwealth Assistance for Africa Programme (SCAAP) and Technical Cooperation Scheme (TCS) under Colombo Plan were recognized as important components of India’s development partnership and cooperation with the developing world under the South-SouthCooperation framework. During 2010-11, around 5500 civilian training slots under ITEC/SCAAP were allotted to 159 developing countries. Under TCS of Colombo Plan around 500 civilian training slots were allotted to 18 member countries of Colombo Plan. In addition, bilateral projects and feasibility studies, experts in civilian and defence services, as well as aid for disaster relief were provided to friendly countries. The scheme for Overseas Citizenship of India has been extended to cover all overseas Indians who emigrated after January 26, 1950. Overseas Citizens have been granted parity with NRIs in respect of facilities in economic, financial and educational fields, with some exceptions, besides lifelong multipurpose multi-entry visa and exemption from registration with local authorities. Prime Minister chaired the third meeting of his Global Advisory Council ofOverseas Indians, which was attended by thirteen eminent Indians from across the world. The members of the Council appreciated that many of the suggestionsemanating from previous meetings of the Council has been implemented, such as merging of Overseas Citizenship of India and People of Indian Origin cards and facilitating voting rights for Non-Resident Indians. The Passport Seva Project was expanded to cover most of the country, which now has 70 Passport Seva Kendras. During 2011-127.57 million passport related services were rendered, including issue of 5.87 million passports in India.